This week we are reviewing the Boston Leather: Leather Radio Strap, Radio Holder, and Anti-Sway Strap. They were tested and reviewed over a two-month period by members of the Stafford County (Virginia) Fire and Rescue Service. Recently we tested the Boston Leather Radio Strap, Radio Holder and Anti-Sway Strap. Boston Leather products are know in the fire service to be of high quality, and long lasting durability, and this product held up to those expectations. The universal radio holder claimed to snugly and securely hold a small to midsize radio with just two elastic straps. One strap wrapped around the base of the radio and held it tight against the holster. The other looped over the top of the radio and snapped back into the holster, preventing the radio from lifting up and out. Both straps worked perfectly, and held a small radio tightly in place. I did try a larger radio and found that it would not work if that's what you were purchasing it for. It covered the speaker ports on a larger new Motorola Radio, as well as barely stretching far enough to reach the snap for the top strap. When ordering one, you do have the option of specifying a larger size for Motorola radios. The holster was made of velcro, elastic, leather, and chrome metal clasps and snaps. Very good looking holster, with excellent craftsmanship. The shoulder strap was also made with high quality leather, and fit comfortably across the shoulders. My only complaint would be the length of the shoulder strap. As a 5'10" guy, I had to have it at full extension to keep the radio peeking out from under my turnout coat. If my torso were any longer I would run into difficulty. But I see that you have the option of ordering a longer strap when you get one, so if you’re 6-ft tall or more, then get one of those. The entire holder and strap held up well when put through practical applications, and showed little to no signs of wear and tear over a 2 month period. Crawling through training props, burn buildings, fields, gravel, etc.. Nothing seemed to pose a problem, and it's craftsmanship and durability were never in doubt. 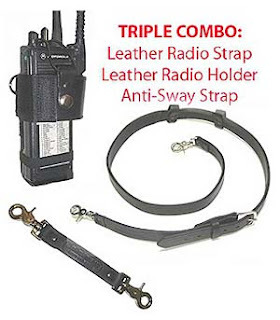 I would recommend this holster and strap for a midsize individual who wanted a universal strap that could be used with numerous radio types and styles. 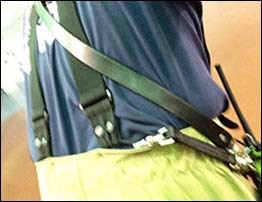 The anti-sway strap firmly secures the radio strap with radio to the firefighter's side. The anti-sway strap allows the firefighter or EMT to move and operate knowing that the radio isn’t going to end up directly in their way. Oftentimes we bend to lift a patient or pick up equipment and the radio, strap and all, slide around right to where we are working. The anti-sway strap prevents needless harm to patient on EMS runs. 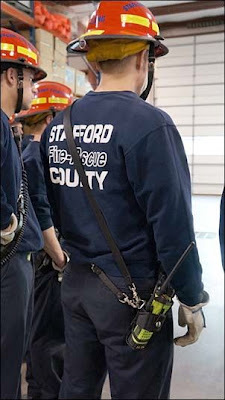 The strap secures under our turnout coat and does not become a hindrance during fire ground operations. 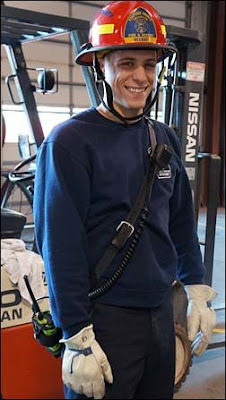 Northern Virginia Fire and Rescue Department operations suggest that the radio with strap be carried under turnout gear for safety. Our (Stafford County) turnout coats do not have an exterior attachment point for the anti-sway strap. We are resigned to secure the strap to suspender attachments. This proves to be somewhat difficult during emergency operations. This attachment point does keep the radio and strap from sliding in the way of duties being performed. The anti-sway strap is extremely durable (leather construction) with strong attachment points. We recommend this strap for its safety advantage as well as its ability to prevent that nagging radio in the way every time you bend over to perform a basic duty. It is an item that will last many years and probably outlast the radio that it supports. To get your own Boston Leather Radio Strap Combo, click here.